Thought I would share a few tips with everyone that might help you to wrap up your digital world for 2018 and get prepared for 2019. Clean out your photos from the past year, I am sure there are hundreds of shots that you really don’t need to save. This can be a fun process as it will help you to think back about everything that you experienced in the past year. Make sure your photos are backed up, you don’t want to be thinking about this while looking at your phone in pieces or at the bottom of a lake. Do the same with any important files or documents. Think about the worst case scenario and plan for that. Someone breaks into your house and steals your laptop and your external USB drive, or worse your house burns down, are you prepared? Clean up your systems. That could be email, folders on your computer, or your physical desk or space. Take some time to remove or at least reduce the clutter and make room for the year ahead. A great way to manage your digital folders is to create a folder for each year, this way you can start fresh each year, it also makes backups much faster. Change your passwords. Now is a great time to go through and change passwords for at least high risks sites like banks, insurance, healthcare and shopping sites. If you use the same password for more than one site, STOP DOING THAT!! If you use the same password on multiple sites and one of those sites is compromised, hackers will have access to any of your accounts where you used the same login ID and password. Check in with people you care about to make sure they are not using the same password for multiple sites. Check your privacy settings on social media sites, especially Facebook. You don’t want to be sharing all of your personal information, thoughts, pictures and friends with the entire planet. Watch your Credit Reports/Score. You can request a free credit report from each of the three main agencies once a year. Credit Karma is another free service that provides you with your credit score and also watches your credit reports. The link above is to a Forbes article explaining how they can offer this service for free. One more tip, you can contact each of the three credit agencies and put a freeze on your credit with a pin number. This will stop anyone from accessing your credit file without you first unlocking it. What happens if you leave the planet tomorrow? Does someone else know how to access critical accounts you have setup? Do you have beneficiaries properly defined on insurance and other important financial accounts? Start a Goals Journal – What do you want to accomplish this year? Write it down and then set a plan to achieve those goals, check back in regularly to see how you are doing. At the end of the year, take some time to reflect and document what happened over the past year in your journal. Watch “It’s a Wonderful Life” and “Wonder” and then give some thought to what you could do in the next year to make a difference in the lives of those around you. How productive are you? Complete this survey to find out today. Hello Control Your Day Crew! First off I am sorry it has been so long since I updated my blog, I have been busy with a few big projects. A number of you have asked if I am going to publish a new version of Control Your Day, I do have some great new ideas to share, I just have to get through a couple other projects and then I can work on CYD Version 2.0. Please drop me a line with any ideas or suggestions you have, if I include them in the next version I will be sure to give you credit and send you a free copy of the book. I came across a great productivity questionnaire that you should definitely complete. Once done, the site will provide an analysis of your time management skills. You answer a series of questions, it only takes a few minutes, and they give you a page of feedback with your results and suggestions on how to improve. I thought they nailed it with the following line about me. Your answers indicate a highly significant pattern of good time management, with a little easily distracted, behavior. This blog post is a bit out of the norm for me but I thought it would be great to share these ideas with my audience. At the beginning of each year I go through all of my monthly expenses and check to see if there is any way I can reduce the cash that is flying out of my wallet. My intention is not to reduce the quality of the services, just reduce the costs. The link to the Samsung product is an affiliate link, the other links are just direct to the site. If you have your home protected by one of the major players like Vector or ADT, there is probably room to negotiate your rate down. There are many internet based providers offering services for as little as 10.00 a month. You can also purchase a product like the Samsung Smart Things Home Monitoring Kit ,this kit will allow you to monitor your home from your smart phone and even control lights and other devices. If you want to stay with a primary provider, I suggest you call them up and tell them you are shopping services and have found online services that are much cheaper than what they are charging. If you have been a customer for a long time use that to your advantage as well. I was a customer for 10 years and I had been paying a monthly maintenance fee of $6.00 that I never used. I was able to drop my payment from $90 a quarter to $57 just by asking for a better price and I removed the monthly maintenance fee. This suggestion comes first with a warning, if you struggle to pay off your credit cards each month, then skip over this one. If you do pay 100% of your credit card balance each month, then you should try to pay as much as possible with credit card to earn rewards. I find the cashback cards are the best. You earn anywhere between 1% and 6% back on your purchases and use you apply the rewards as a credit to your account. I have been using Chase Freedom for years, I usually get a credit of about $250 once every 3 to 4 months. I pay for everything I can on the card, food, gas, garbage collection, cell phone, cable, etc.. If the service provider will take credit card and not charge a fee, I do it. Chase Freedom selects a few premium categories each quarter where they will pay 5% back, the rest is usually 1% or 2%. I am moving from Chase to American Express Blue Cash Everyday card, they offer 3% back on groceries and 2% back on gas, my two biggest monthly expenses. Also if you are a senior and your card has an annual charge, you can ask if they will waive it for you. My provider was coming in every two months and charging me $60.00. I contacted the office and was able to change to quarterly visit at a cost of $75 per visit, reducing my annual spend from $360 to $300. I will let you know if I start seeing any new bugs. This one drives me completely insane. Each year I get a renewal invoice for $204.00 for the annual service for one car, my wife’s car. I have to call up and tell them I want to cancel my service, they then transfer me to the cancellations department. I explain that I just don’t see the value in paying $17 a month for this service. After a bit of back and forth they make me an offer of around $99.00 for the year. I used to think this was all just a scam, we have a 25 year old house and something always seems to be breaking down, especially the heat and A/C. I signed up with First American Home Warranty service 3 years ago. I pay $500 once a year and they cover a whole list of items in the house. You just pay a 75.00 service fee when you call for service. I used to get turkey sweats whenever the A/C or heat went out, assuming it was gong to cost me hundreds of dollars to fix, now its just $75 and the service provider resolves the problem. There are many services online that will review your insurance costs and provide quotes from other providers. I don’t have one that I can recommend but you can easily find them on the web. I have been with the same provider for 10 years, each year I go back and ask if there is someway he can save me a few dollars and he always finds something. This past year I let him know that my son’s car sits at the house most of the year while he is away at school, he lowered my payment by $200 a year. Life insurance is another one you should check every couple years. Especially if you are in your 40’s or 50’s. If you are in good health you might be able to get a new policy at a cheaper rate that carries you out more years. One note here, don’t cancel your existing policy until you have the new one in place. Again I don’t have any specific sites to recommend but you can find loads of them on the web. Finally I am not an expert in any of these areas, I have no official training or certifications, I am just sharing with you my experiences. Please obtain professional advise if needed before making any decisions or changes. If you have suggestions to add, please comment on the post and feel free to share it with others on your social networks. I wrote this as a guest post for Joy Healey over at www.joyhealey.com. Joy blogs about internet marketing, blogging, ebooks and other topics, she also posts reviews on books of interest. What does your email inbox look like today? When I say inbox I am really talking about all of your collection buckets. A collection bucket is any place or device or software that you use to keep track of all of the things you need to get done: like projects, tasks, errands, bills, etc. You might have a box on your desk at work, or maybe just a section of your desk where you pile papers you need to get back to. What about at home? Do you have a place where you keep bills to be paid, receipts to be filed, things you need to do for your kids, pets or other family members? Do you have multiple email accounts? How do you keep it all organized? In this article, my goal is to share some proven techniques with you that will help you reduce your stress levels and the time you spend managing your systems. The concepts I am going to cover are all based on the bestselling book “Getting Things Done” by David Allen. David is a productivity guru, if you have not read or heard about his book you should check the link above, after you are finished reading, and pick up a copy. You need to develop a trusted system and reduce the number of collection buckets you have. If you are a paper person, it is fine to have a collection box for work and for home, but make sure everything gets into that box and that you work through each box at least once a week (Weekly Review). The Weekly review is critical to the success of your system, if you don’t perform this step, then your collection box will quickly get out of control and out of date. You can do the same thing with your email. You can use your email software to manage all of the inbound and outbound messages and insure that you stay in control. A few years back, I developed a system (Control Your Day) that uses Microsoft Outlook and the concepts of Getting Things Done to allow you to take back control of your Email Inbox. You can get more information about how to set up the system at ControlYourDay.net. Thanks to spam, and to the fact that we are leading multi-faceted lives these days, most people have a number of email addresses they use for different purposes. In my case I have an email address for each book I publish, a personal address, an email list address and a number of others all on Gmail. Instead of checking each mailbox individually, I set up the auto-forward feature for each account and auto-forward all of my email addresses to my primary personal address. My personal address is set up in Microsoft Outlook so that I can manage all of my messages in Outlook. I can still see who sent me the original message and I can reply from any of the email addresses I have setup. You can see I have multiple collection points but they all funnel into one system, one final collection box that I can then manage. This is another “Getting Things Done” concept from David Allen. I have a great story that clearly highlights the value of setting next actions. Last summer, one of my drain pipes broke on my garage. Every night when I came home from work, I would see that broken drain pipe and think to myself “I need to fix that” which created a bit of stress for me. On the weekend I would be out running errands and I would remember that I needed to fix the drain pipe but then I would realize I didn’t know what parts I needed to complete the job. This is where Next Actions come into play. What was my first Next Action for this project? I needed to figure out the parts that I needed for the job. I took a few minutes and measured everything out and wrote down a list of parts. That completed my first deliverable for this project, a bit of relief. My next action was to get that list on to my errands list. During my next visit to the home improvement store, I was able to pick up all of the parts that I needed. My next action was to block out some time to get the project done. The weekend came and I had all of the parts and an action plan. I was able to fix the drain and get onto another project. You can apply these same concepts to your email. When you read an email you may not have time to work on it immediately. Can you set a next action and put that information in a comments field or at the top of the message? This way when you come back to that message you don’t have to read through it again to figure out what the next action is; you already have that written down. Take that one step further and define a context for your next action. In my drain pipe example, I talked about my errands list. This is an example of a Context List. How many times have you gone to a store, walked around with a thought in the back of your head that you needed something but you couldn’t remember what it was? Then you get back home, try to turn on your lamp and realize you needed light bulbs. You can build context lists for errands, phone calls, things to do when you are at the office, at home, etc. Then you can use these lists to work productively within that context. If your collection boxes (in-boxes) are out of control, they are creating stress for you, causing you to miss deadlines or fail to deliver on commitments you’ve made. If you can take back control, you will put yourself in a position of power and take just a little bit of stress out of your life. If you think these concepts would help you take back control, pick up a copy of “Getting Things Done“. 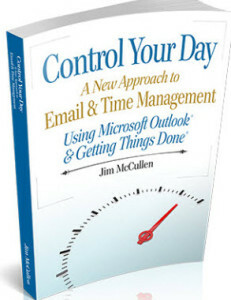 If you are a Microsoft Outlook user, then you should add “Control Your Day” to your reading list. I came across a great post today by Martin Webster. This is a great post to print out and post on your wall right next to your monitor. I need great reminders like this to reset myself every once in a while, especially when my workload gets overloaded. Latest Gmail phishing scam. A hacker that knows your email address and cell phone # goes to Gmail and requests an SMS password reset. They then send you an email from an address that looks like it is coming from Google or a text and say your account is at risk, they just sent you a code, please reply back with that code so we can protect your account. The hacker now has the code and can login to your email account. They can then take it over or worse add themselves as an auto-foward and watch everything you do. Here is a link to an article with more details on this scam. Before I start on this subject, I need to tell you a story. I was in the middle of a global training session in Hong Kong with about 25 people in the room along with a few of my associates. About 10 minutes into the meeting I glanced over at one of my mates and noticed he was chuckling with one of my other team members. I finished up my presentation and when the group left for a break I walked over to find out what was so funny. They had two words in front of them and each had a count of at least 20. The words were “actually” and basically”. I asked what was going on, they told me they had been counting the number of times I said each of those words in the presentation. definitely a bit shocking and I can assure you my next presentation had a lot more pauses and a lot less of those two words. The next time you attend a sales pitch or a presentation, listen for these filler words and how often they are used. When you listen to someone that does not use these filler words, how much better do they come across than someone who uses one of these words or phrases to convey each thought or concept? Think about those poor folks in my presentation, they were from China, Japan, Korea, Taiwan. English was a second language for all of them and I was making them convert useless words in their head so they could listen along to my presentation. The next time you give a presentation or sales pitch or are just involved in an in depth conversation give thought to how many times each of these words or phrases come out of your mouth. If you really want to challenge yourself, you can ask someone in the room to track the number of filler words you use, if you are not ready for that, try recording the session on your smart phone and then go back later and listen to what you said. Well basically that is all I have to say, actually if it didn’t meet your expectations i am sorry, hopefully it did. Have you lost control of your email? Tasks and to-do items slipping through the cracks? Forgotten commitments coming back to bite you? Trying to get to Inbox Zero? Control Your Day (CYD) is an email management system I designed (using Microsoft Outlook) based on the GTD concepts presented by David Allen in his best selling book Getting Things Done. CYD does not require any special plugins or additional software, just a standard copy of Microsoft Outlook. The concept is to bring all of your tasks, to-do items, commitments and emails into one view in Outlook using only email messages. We shut down your inbox and instead setup a virtual search folder that shows you messages in order based on your priority and includes messages you have both sent and received. From there you can break messages down into segments or contexts so you can focus on the right work at the right time. The Control Your Day book first explains the system and then provides a step by step guide to help you get your new system setup and running. There are thousands of people across the planet using CYD today. CYD was first introduced years ago to the GTD community through Tara Robinson and the GTD Virtual Study Group. Thanks to the global reach of Amazon.com, CYD is in use by thousands of people across the globe. You will find everything you need on the site to get started with CYD. Wishing you a happy, healthy, prosperous 2015.